Our next Play that Paid Off serves as a warning to teams who do not respect wildcat quarterbacks' passing ability, especially on deep balls. This play, the first play from scrimmage in the matchup between the Bengals and the Redskins, was nominated by Kyle Clark is our Facebook group - nice one Kyle! As always, I'm going to noodge you (that's right, I'm breaking out the Yiddish) to nominate as many plays as you like this Sunday and Monday, either in the Facebook group, or by tweeting out a description of a play with the hashtag #TPL5plays - if we go with a play you nominated, you'll even get a mention, just like Kyle! This play highlights how pre-snap adjustments by the defense, in this case a reaction to the 'wildcat' package, can take a team out of sound coverage and put them in bad positions that the offense can easily exploit. 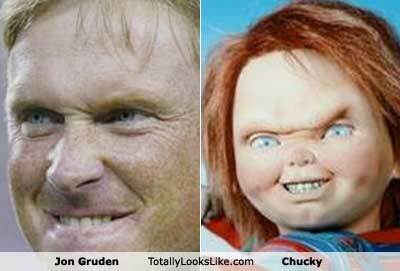 The play also shows how Cincy OC Jay Gruden, younger brother of Chucky, was able to use the formation to create a favourable mismatch between the team's best receiver and an out-of-position Redskins defender. Enjoy! 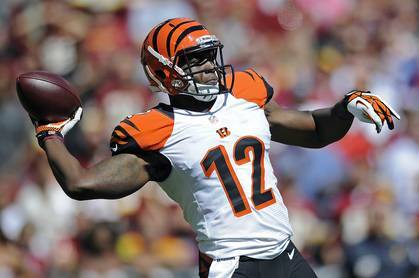 Cincinnati Bengals @ Washington Redskins, 1st quarter, 14:53 left on the clock, 1st & 10. 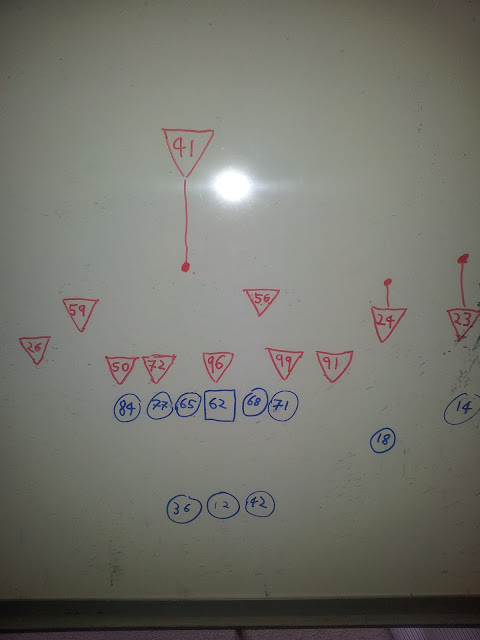 After the huddle: The Bengals line up in a shotgun pro set - i.e. the split backs you'd expect of the pro set, either side of a QB in shotgun - in their wildcat package, with rookie receiver Mohamed Sanu at quarterback and regular QB Andy Dalton lining up as receiver on the outside; the other receivers are AJ Green in the right slot and Jermaine Gresham at tight end on the left. The Redskins line up in their regular 3-4 base defense, not adjusting to the unbalanced formation with Wilson on the right side, not covering anyone in particular but rather appearing to keep outside contain, while SS DeJon Gomes comes down to cover Green in the slot. Pre snap: There are no pre-snap motions from the offense, but London Fletcher, moving over to the outside, signals for free safety Madieu Williams to come into the box (represented by the dot in Fig 1), while Gomes and Hall back off their receivers (also represented by dots). The play: The play is a drop back pass off of play-action. It is quite clear that the Redskins defense are thinking that the Bengals will be running the ball out of the wildcat, and do not seem to believe that Sanu is really a threat to pass the ball, evidenced by the pre-snap adjustment on the defense that left no deep safety, effectively checking into a Cover 0 shell. The adjustment ultimately proves costly for the Redskins. 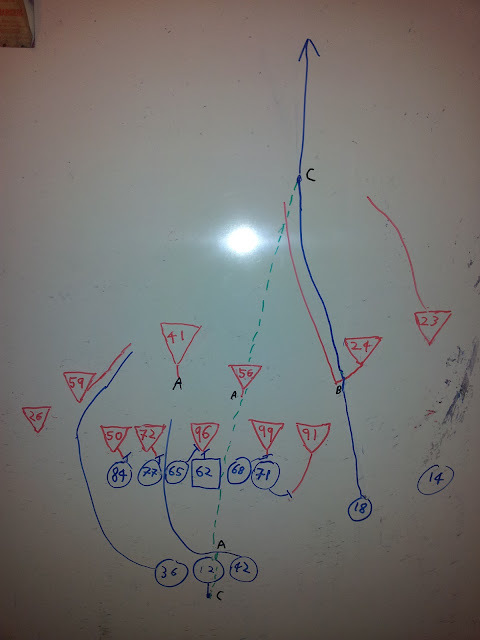 The first element of the play is the play-action, marked by point 'A' in Fig 2. Green-Ellis runs across the front of Sanu, faking receiving the handoff, and turns downfield through a relatively large hole that has opened up between Whitworth and Boling. This has the effect of slightly drawing in Riley and Williams, also marked by 'A', who otherwise may have rushed straight for Sanu and potentially been able to tip the throw. The other running back, Pressley, runs to the left of the line, looking as if he was going to doubleteam Jackson with Gresham, but Gresham turns Jackson back inside, allowing Pressley into the second level where he appears to fake as if going to block Fletcher, chasing him down as he runs towards Green. By putting Green into the slot, rather than on the outside across from Dalton, he is covered by a safety, Gomes, instead of either Wilson or Hall, who would likely have been able to handle Green better than Gomes does, so Bengals OC Jay Gruden deserves credit for drawing the play up in a way that would have drawn that mismatch in coverage. The key to Green getting so open occurs at point 'B', and is pretty straight forward. Green initially runs downfield, angling inwards; it is clear that Gomes is trying to give Green inside release, perhaps so that Williams or one of the linebackers would be in position to undercut a throw to Green. As such, Gomes turns his shoulders, believing that Green is going to continue inside. At B, however, Green merely turns very slightly to the outside without breaking stride so that he goes outside of Gomes. Having now gained outside leverage of Gomes, Green needs to merely turn on the burners - Hall has no chance of catching up to him - and with no-one over the top of him whatsoever, thanks to Williams coming down into the box pre-snap, all that is left for him to do is catch Sanu's well-thrown ball and spring into the endzone to start the game with a bang. Thanks again to Kyle Clark for nominating this play, and we'll be back tomorrow with our last Play that Paid Off of Week 3 to tide you over until kickoff on Sunday.